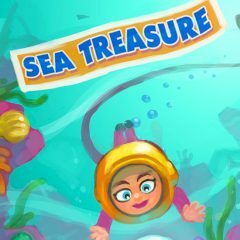 Treasure hunters seek for treasure everywhere, so this diver decides to dive and search the bottom of the sea for the presence of goods. Clear your path to the treasure using a less moves as possible. The sea holds many secrets, but for those who seek it will reveal all goods and wonders. Young girl doesn't afraid of danger ahead, so she wears a diving suit to search the bottom of the sea for treasures. She will definitely find one, but your oxygen is limited, so you need to hurry up and finish your dive quickly!